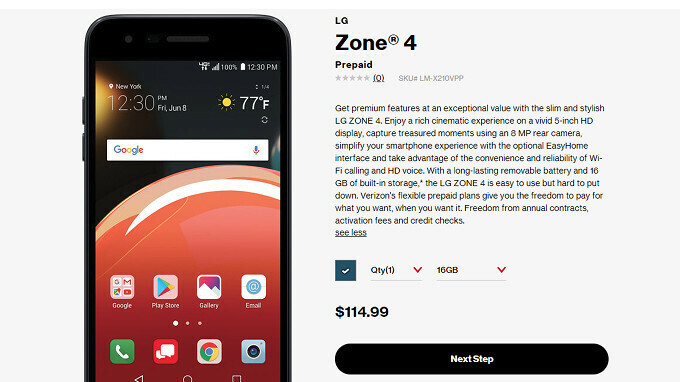 The first details about the budget-friendly LG Zone 4 emerged back in December when we learned the South Korean company plans to drop the “Optimus” name and bring the smartphone to the US carrier. One month later the handset was spotted at FCC (Federal Communications Commission), thus confirming the initial report claiming the LG Zone 4 will eventually make its debut in the US. Well, it appears that the sequel to the LG Optimus Zone 2 and Optimus Zone 3 is now available for purchase at Verizon, and it looks like you won't have to break the bank to get this one. The affordable LG Zone 4 can be had for just $115 on prepaid, a bit higher than we originally thought. The smartphone ships with Android 7.1.2 Nougat operating system on board and sports a 5.0-inch HD (720p) display. The Zone 4 is equipped with a 1.4GHz quad-core Qualcomm Snapdragon processor, 2GB RAM, and 16GB expandable storage. The 2,500 mAh battery inside should offer up to 16 days of standby time or up to 30 hours of usage time. Also, the LG Zone 4 comes with an 8-megapixel rear-facing camera and a secondary 5-megapixel snapper in the front. According to Verizon, the entry-level smartphone features HD Voice and Advanced Calling, as well as LTE support.